Mandawa is famous for the painting villages, finest frescos can be founded on walls here. 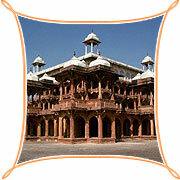 Bikaner is famous for forts & Rat Temples where rats are worshipped. Visit Junagarh fort, Lalgarh palace, and jain temples. Jaislamer famous for camel safari& havelis, known as golden city. 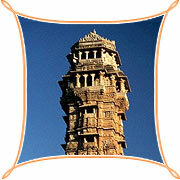 Visit jaisalmer fort, jain temples, Museums, stay one night in hotel & one night in desert. Jodhpur known as blue city. Every house is painted blue here. The blue houses can be best seen from the ramparts of the mighty Mehrangarh fort. Traditionally blue signifies home of Brahmins. Visit Meherangarh fort ,Umaid bhawan palace & museum. No city in rajasthan is as romantic as udaipur. Udaipur called the Venice of east. Udaipur's Piece de resistance is the lake palace, a building in white marble built over an entire island that appears to float on the lake's water. Visit jagdish temple, city palace, lake pichola. Pushkar camel fair is India's grand epics. Each year 200000 people flock to pushkar for camel fair. A golden blaze of sand envelops the stark lands in pushkar. You see traditional women here and men in colorful dresses. Jaipur vibrant capital of rajasthan, called pink city for the color of building in city. Visit hawa mahal (palace of the winds), city palace complex, jantar mantar, amber fort sprawls a top kalikoh hill take a elephant ride to reach there. Here some of most detailed studies on tiger reserves are conducted. Tigers can be seen here. The park covers 1334sq. km.According to 1999 census the park has total of 42 tigers. Via Fathepursikri and bharatpur bird sanctuary. (Agra Famous for Taj Mahal, the most extravagant monument ever built for love. Tajmahal was built by emperor Shah Jahan as a mausoleum for his 2nd wife Mumtaz Mahal. Visit Tajmahal at sunrise and sunset, Agra fort, Sikandra.